I owe A Round of Words in 80 Days (ROW80) another Wednesday check-in. Fortunately, I finally have something significant to report. My original goals were to sleep (get to bed before midnight, I believe); eat well (get off the white stuff, processed foods, added salt, sweeteners); and show up at critique meetings with something to be critiqued (in other words, write). Before I discuss progress, I’ll note that Austin Mystery Writers (AMW) is alive and well. Several members have been on hiatus, dealing with other projects (such as work), another can’t attend regularly (again, work), and this week our Grand Pooh-Bah moved a hundred miles to the north. Only two non-Pooh Bahs remained to stay the course, and we considered four eyes insufficient to ferret out the flaws in our respective manuscripts. Last night, however, concern vanished. Two new members joined us, a third has promised to drop in next week, and two others have listed themselves as maybes. Being in a critique has been a good experience for me. In addition to ideas and advice, I’ve received encouragement and support for my writing and for my personal life. My partners have helped me over some rough spots in the past couple of years. I’ve also learned a lot. Since we’ve been together, one partner has published a novel and has more in line for publication. Two others have completed manuscripts. While in one sense I’ve been stalled–scrambling down bunny trails, trying to get my plot under control–I’ve learned about the business of writing. As to my own WIP: Pieces continue to fall into place. Listening to a presentation at the Austin Sisters in Crime meeting last Sunday, I had a brainstorm–a detail that would make a central character’s motivation much more credible. I flipped to the next page in my notebook and scribbled it down. I’ve also had another idea about reframing the novel to update it a bit. When I realized that Molly hadn’t once, in nearly three hundred pages, gone online, I pulled out Chapter One and inserted Internet. Today I retyped Chapter One. The experts say not to do that–especially considering the number of times I’ve rewritten it, trying to get the foundation right–but I’m not revising so much as remembering. It’s been through many incarnations, and typing requires me to read more closely than I would if only my eyes were involved. I’ll continue this process for three or four more chapters, inserting new segments where appropriate (I hope!). Projected changes add originality. They give Audrey Ann, a minor character, more opportunity for mischief-making. Audrey Ann is a hoot, and I look forward to spending more time with her. I’ve added a progress meter to the sidebar on the left. Five percent represents progress on the current draft–in other words, what I retyped today. I’ve been working on this project, and talking and writing about it, for a long time. I don’t want to give the impression that I’ve eked out just four thousand words. Now, as to my plan for eating real food: Sometimes I have and sometimes I haven’t. I have, however, dropped nineteen pounds since the first of the year, so I claim at least modified success. Regarding sleep: It’s after 1:00 a.m. No excuses. One last thing about Austin Mystery Writers: When the other left-behind critique partner mentioned we might need to put several of the coffee shop’s tables together to handle the potentially large turnout, it occurred to me that if we works things right, AMW could become the Austin equivalent of the Algonquin Hotel’s Round Table. A heady thought. 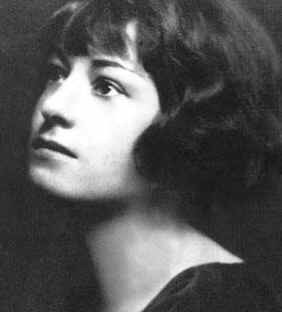 Critique partner said I could be Dorothy Parker. She wants to be Tallulah Bankhead. I wish I could be the glamorous one, but with my evil tongue, Dorothy P. is right down my alley. More’s the pity. I’ll try to be nice. Great to hear the group is retaining some original talent whilst branching out 🙂 Love to think of you as a Texan-Algonquin-equivalent. Phil and i stayed at the Algonquin when we went to the Big Apple. Fab, it was. We pretended to be bohemian writers as we sipped our coffee. Best beds in New York too, I am informed. You stayed at the Algonquin? I am so envious. I’ve never even seen it. Sad to say, the conversation around our table hasn’t reached the heights attained by the originals. Last week, after the critiques, we talked about back aches. I’m so happy to hear this! AMW is alive and well! I hope the group continues to rock on. And yes, 19 pounds–you DO rock! That’s all the exclamation points I’m allowed,but thanks so much for this post. It makes me feel happy. AMW: so far, so good. Feel free to use all the exclamation points you want. I’m not in critique mode. Hello, all you writing dahhhhhhlings out there. All a girl needs is a mink coat, a diamond necklace, and a bottle of gin. And we get these things–when? A great check in. I just recently joined my first in-person critique group and I’m excited to become more involved. I love my online writing community, but sometimes person to person is so much easier and opens up real communication. Hope you finish up round 2 with flair! Thanks, Tia. I’ve never been in an online critique group, but the face-to-face ones have been great experiences, leading to friendships as well as better writing.